SEO is the best long-term strategy to getting found online, ranking in Google search and generating new leads for your business. Admit it. You looked again. Your competitor is still ranking for YOUR keyword and you aren’t. You know your site’s traffic depends on getting found in search for your keyword but you’re not sure how to make it happen. Worse. You don’t know how your competitor IS making it happen! The truth is when it comes to search engine optimization (SEO) it’s not all about the keyword. Yes. Keywords play an important role in your Google search ranking. However, they are not the only factor Google’s algorithm considers. Your competitor understands this. Knowing the other factors and how they impact your site’s ranking is just as critical as identifying the keywords you want to rank for. Maybe more important because Google likes to change its algorithm from time to time. Without warning. This is frustrating and it shouldn’t be that way. At Clicks and Clients, we understand there are more factors at play in your site’s ranking than just the keyword. That’s why we are constantly watching Google for any changes to its algorithm or other factors that can impact a site’s ranking. Starting with our discovery call, together we’ll review all of the SEO factors that can impact your site’s ranking. From there, we’ll develop a complete search engine optimization strategy that takes these factors into account. We’ll even take the time to show you how this works by doing a deep dive into your competitor’s site to understand why they are ranking in Google. We know your business depends on traffic and the truth is, without an overall SEO strategy in place, your traffic will continue to suffer. 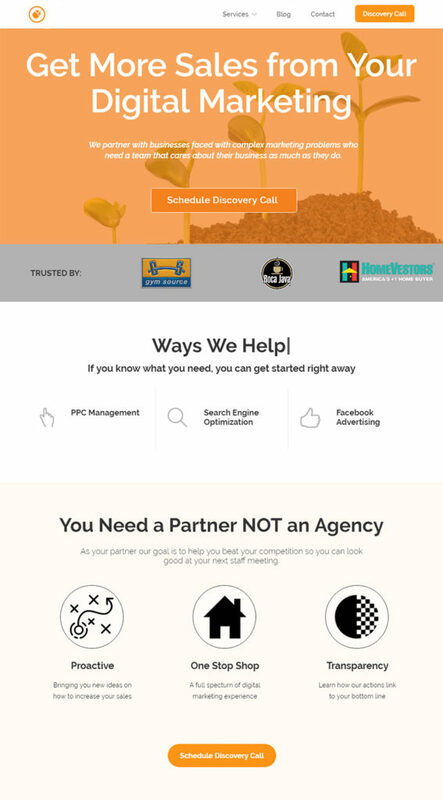 So if you’re ready to look beyond the keywords and develop an overall strategic plan that will allow you to beat the competition, click the button below and schedule your Discovery Call today. As your partner our goal is to help you beat your competition with a long-term search engine optimization strategy.. Linking search engine optimization (SEO) to your long-term goals can be a struggle. Especially, if you don’t look at the various factors Google's algorithm considers when ranking your site. Worse, once you think you’ve got it figured it, BAM! Google changes the algorithm and your traffic tanks. We see this happen all the time. But here’s the thing. If your site’s traffic drops with a single algorithm change, then it’s likely you’ve been playing the “short” game. Deploying "strategies" for quick wins vs. strategies that give you long-term results. Some agencies specialize in the short-term game. Sacrificing the long-term benefits of SEO for quick wins. This is wrong. Working with an agency shouldn't be this way. When thinking about search engine optimization, it helps to consider the difference between a day trader and an investor. Day traders, like some agencies, look for quick wins so they implement “strategies” that provide short-term gains. These strategies are often the ones Google targets with its algorithm changes. Investors, on the other hand, are in it for the long haul. They implement big picture strategies after reviewing the various factors that could impact their investment. This is why they diversify their investments. Diversification takes into account various factors, so for example, when an algorithm does change, the impact to their portfolio, i.e your site’s ranking, is minimal. If it’s even felt it at all. Warren Buffett, CEO of Berkshire Hathaway, underscores this point in this famous quote. At Clicks and Clients, we understand implementing an overall SEO strategy takes time, discipline and patience. That’s why we are constantly looking at all of the various factors included in Google’s algorithm. In other words, we’re not just focused on keywords, like a day trader. Instead, our focus is like that of an investor. Taking into account all factors so we can diversify your search engine optimization efforts. Like you, we’re in it for the long haul, not the quick win. This is the 160 character (think tweet) snippet that summaries a webpage's content. This description is what is displayed in search results below the search terms. The page title is one of the ways Google determines the topic of your page. The page title is found by hovering over an open tab in your browser. This is a great place to use your targeted keywords. Just like you read your website, Google reads your site too. Indexing is how Google analyzes and adds your page to its index. Crawability is simply a measure of Google ability to access and crawl (read) content on a webpage. This is quite literally the content on your webpage. This is where you can include all of the important factors for ranking in search such as images, videos, keywords, links to internal and external pages, etc. Links are HTML codes that point to relevant and related content. This not only helps search engines understand the content on the page but links also provide a key to a page's relevancy to a particular topic.